Following the news that Enstar Natural Gas Customers south of Anchor Point aren’t paying back a loan for the extension of natural gas infrastructure to the southern Kenai Peninsula, those customers may be wondering what this means for their bill. The short answer is nothing, at least for the time being. Enstar provided a 10-year, $3.6 million loan to customers in the Homer service area back in 2013, which partially covered the costs to bring natural gas to the area. But because of low consumption, customers now owe $5.5 million with interest. Enstar is assessing how it will collect those funds and prevent that number from growing. However, it will need to go before the Regulatory Commission of Alaska or RCA, to get its plan approved. The commission regulates utility rates in the state. Enstar says it plans to do so, but it declined to say what its proposal to the RCA will be. Enstar did ask the commission in 2015 if it could spread the Homer service area’s outstanding balance across its entire customer base. The RCA denied that proposal and indicated it would consider allowing Enstar to increase a monthly surcharge applied to customers’ bills in the service area. That charge is the mechanism that was supposed to pay back Enstar’s original investment, but due to lower than expected consumption, the loan is increasing. Enstar says the average home in the Homer service area is consuming about 90,000 cubic feet of gas per year, 50,000 cubic feet below Enstar’s consumption estimate. The current surcharge, which is $1 per 1,000 cubic feet of gas consumed, is costing the average customer in the Homer service area $90 per year. 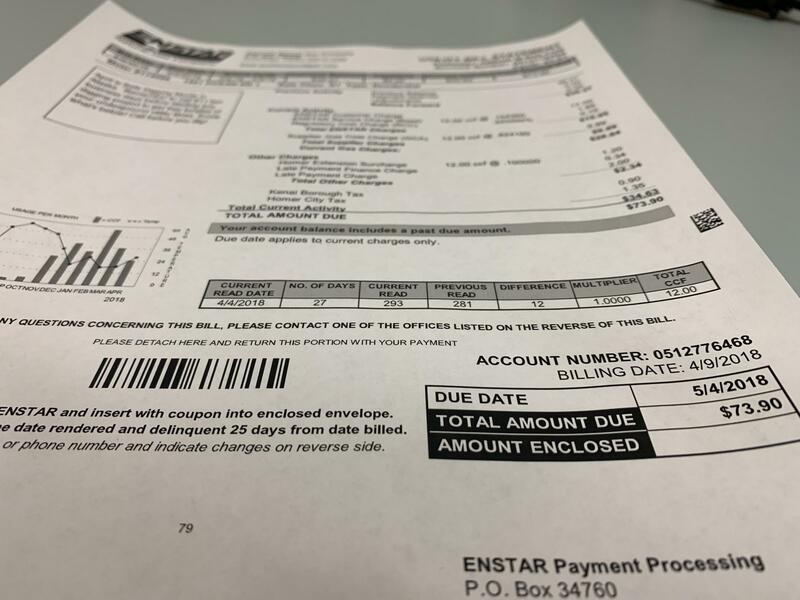 Enstar says it has not made any calculations determining how much that charge would need to grow in order to pay off Homer customers’ balance. Increasing that fee could be the most direct way for Enstar to solve the issue. However, increasing prices is likely to upset customers, and it’s unclear if Enstar has an appetite for that. It’s also unknown when Enstar will make any proposal to the RCA, meaning that its customers won’t see any changes to their bills, at least for now.